Polyline Pro is an easy to use yet powerful and intuitive tool which provides a clear and efficient user interface to create splines precisely with measurements and angles in a manner similar to AutoCAD. The main purpose of Polyline Pro is to bring the spline drawing in 3dsMax at a higher level. 3ds Max and 3ds Max Design 2012 is not supported. This is commersial script. You can find more information here. Submitted by miauu on Wed, 2019-03-13 02:34. Submitted by StormBrig on Tue, 2019-03-12 00:17. Thumbs up. Thank you for this excellent tool. Submitted by miauu on Mon, 2018-11-12 11:53. Polyline Pro version 3.5 is available. -- Edit Mode: allows the user to choose wich segment to edit by pressing the TAB key. Submitted by miauu on Tue, 2018-08-07 14:29. Polyline Pro version 3.4 is available. - when the Protractor is visible you can see a line to which the mouse cursor can be snapped. - shows the distance and the angle between the snapped vertex(the vertex which position you want to edit) and the moved vertex(mouse cursor). - new way to show the angles of moved segments when the Edit Mode is used. Submitted by airbrush on Tue, 2018-05-22 12:19. Submitted by miauu on Mon, 2018-03-26 04:20. Polyline Pro version 3.2 is available. -- Added Parallel to 2 points Object snap. Submitted by miauu on Mon, 2018-03-19 06:23. Polyline Pro 3.1 is available. Polyline Pro version 3.1 is available. 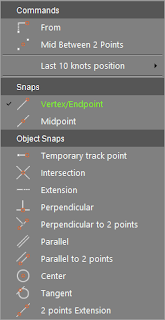 -- Added Perpendicular to 2 points Object snap. Submitted by miauu on Mon, 2018-03-12 13:18. Polyline Pro 3 is available. Polyline Pro version 3 is available. It offers you the new Edit Mode which allows you to edit splines quickly, by moving their vertices using all features that Polyline Pro offers. Submitted by miauu on Fri, 2017-08-18 03:51. Polyline Pro version 2.0 is available. If you are drawing an arc and you use the CLOSE command to close the spline(via hotkey or using the menu) the spline will be closed with the arc, not with the straight line. Please, watc the attached video file. Submitted by miauu on Sun, 2017-05-21 03:45. Polyline Pro version 1.9 is available. - added support for 3ds Max 2018.